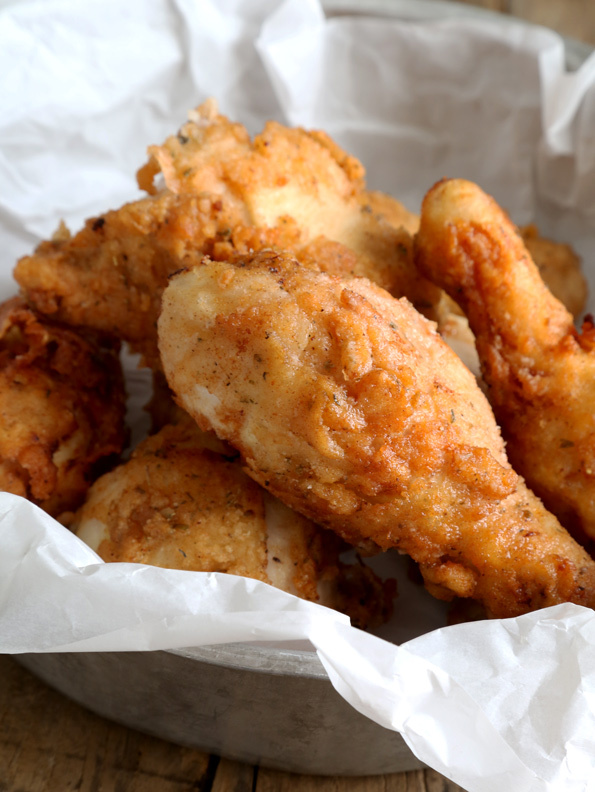 Gluten Free Fried Chicken KFC-Style | Great gluten free recipes for every occasion. Missing that extra-special blend of 11 herbs and spices in KFC chicken now that you’re gluten free? 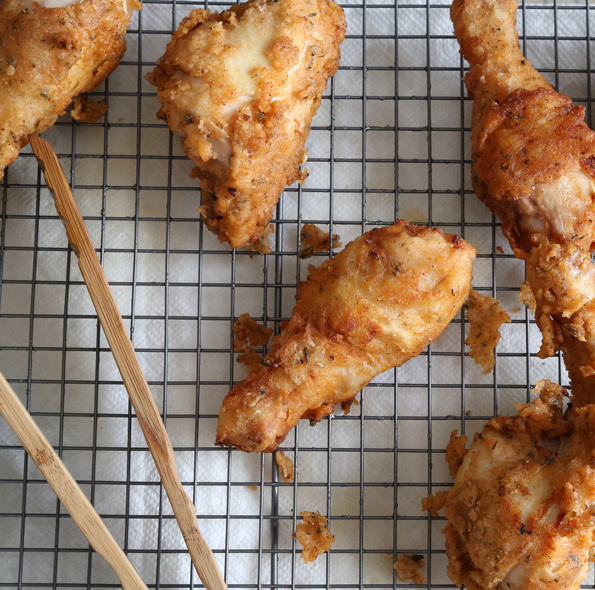 This gluten free fried chicken will be a welcome addition to your family traditions! How to fry chicken is the sort of thing that anyone who has ever done it has a bunch of opinions about. This recipe for gluten free fried chicken KFC-style is all about the blend of 11 herbs and spices (plus a touch of sugar—it really goes a long way to making a truly delicious fried chicken!). And yes—you do have to use a basic gum-free gluten free flour blend. If you use an all purpose gluten free flour blend with xanthan gum, you’ll be very, very sorry with the gummy mess that you have on your hands (and on your chicken). There isn’t much to making this chicken, beyond soaking it in buttermilk, then blending up the flours, herbs and spices. But promise me you’ll read through the whole recipe at least once before getting started? It’s not very long and doesn’t have too many steps at all. But each ingredient and each step is there for good reason. I promise! 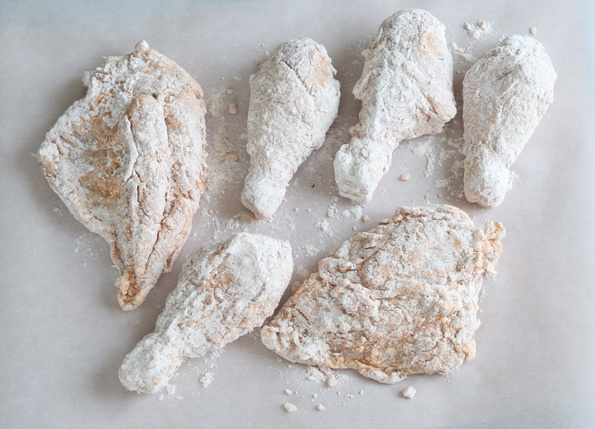 Allowing the flour blend and spices coating to soak into the chicken for about half an hour before frying really helps the coating stick to the skin, rather than slide right off in the frying oil. Maybe you’re spending the long holiday weekend at the beach (lucky you!). Maybe you’re just looking for an extra special weekend meal. 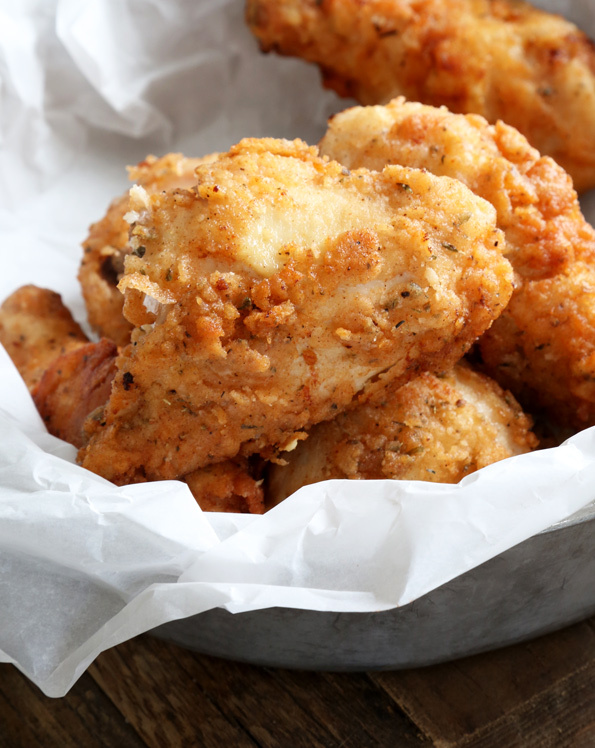 Try serving up some of this gluten free fried chicken. It’s amazing right out of the fryer, but some may say it’s even better piled into containers and eaten at room temperature (or cold!) the next day. Let the celebrations begin! *F0r easier frying, and easier eating, try slicing each split chicken breast in half while it’s still on the bone. A large sharp knife and a swift motion will do the trick. In a large, zip-top bag or large bowl, place the chicken parts, buttermilk and yogurt, and stir to coat the chicken parts fully. Squeeze out all of the air if using a zip-top bag before sealing the bag. If using a bowl, cover the bowl tightly with plastic wrap. Place the chicken in the refrigerator to marinate for at least 4 and up to 16 hours. Once the chicken has finished marinating, in a medium-size bowl, place the flour blend, pepper, salt, paprika, oregano, thyme, parsley, cumin, cinnamon, onion powder, garlic powder, chili powder, and sugar, and whisk to combine well. Pour all of the dry ingredients into a large, zip-top bag. Line a large rimmed baking sheet with parchment paper and set it aside. Remove the chicken parts from the marinade, about 2 at a time, and place in the bag of dry ingredients, seal the bag and shake to coat the chicken parts fully. Remove the chicken from the dry ingredients and place on the prepared baking sheet. Allow the coated chicken to sit at room temperature for about 30 minutes to allow the dry ingredients to form a thick paste on the chicken. This will help the coating stick to the chicken during frying. While the chicken is sitting, prepare the frying oil. Place about 3-inches of frying oil in a large, heavy-bottom pot or fryer. Clip a deep-fry/candy thermometer to the side of the pot or fryer, and place the oil over medium-high heat. Bring the oil temperature to 350°F. Place the coated chicken parts in the hot oil, taking care not to crowd the oil. To prevent the chicken from sticking to the bottom of the pot, hold each piece with tongs or a spider in the hot oil just above the bottom for about a minute to allow the bottom skin of the chicken to seal. Fry until golden brown all over, about 7 minutes on each side. Turn the heat down to bring the oil temperature to 325°F and allow the chicken to continue to cook until the internal temperature of each piece reaches nearly 165°F (about 10 minutes more). Place the chicken on a wire rack placed over paper towels to drain and cool before serving. Love, Me P.S. If you don’t have your copy of Gluten Free on a Shoestring Bakes Bread yet, won’t you grab one today? Thank you so much for your support! I worked at kfc. I can tell you we didn’t soak chicken or use buttermilk. We dipped the chicken pieces in water, shook it, put it in the flour mixture, sifted the flour and coated the chicken again. That’s it! This recipe sounds great! But, then they all are. I can’t wait to try it. Have all of your books and I’m eagerly awaiting your next one. By the way, King Arthur Flour has an excellent gum free flour that I think would work well with this recipe. Thanks Nicole! This chicken was much enjoyed at our family bbq this weekend – and it truly tastes better on the next day as the spices get absorbed into the chicken. Nicole thank you very much for this recipe. Your details explain the procedure perfectly. I am still a HUGE fan of your recipes and books! Unfortunately, we can’t have gluten or dairy… :( Is there any way to substitute the dairy from the recipe? Roxy, it should be very easy to make these dairy free. Just use a non-dairy milk such as coconut, almond, or rice milk. Add 3 tsp of apple cider vinegar (or lemon juice) to the non-dairy milk and let it set about 10 minutes-this makes your buttermilk. So Delicious brand makes a coconut milk yogurt I really like, there are almond brands out there too. Just be sure the brand you buy is gluten free and dairy free. Use one of these for the yogurt in this recipe. I hope this helps you. Enjoy! I’m not gluten-free, but love KFC chicken. Can I substitute all-purpose flour for the blend? This is a gluten free recipe, Traci. I’m afraid I haven’t tried any of my recipes at all with conventional gluten-containing flour! Okay, thanks anyway. I thought maybe with your experience with cooking that you would know if the two are interchangeable. So if you see a recipe with all purpose you know you can sub your blend etc. Yes you can use regular flour. This is my basic fried chicken recipe but I also add cayenne, garlic and pepper to the buttermilk soak. Letting the coated pieces sit for 30 minutes is the trick. can i use breasts and fry my skillet pan??? can they be baked in oven?? I honestly don’t know if this would work well in the oven, Tracey. Feel free to experiment! I don’t recommend shallow-frying them as they will absorb much, much more oil that way. That seems like a long time to cook it. I thought chicken would cook in about 15-18 mins. when frying it in a good bit of oil. Charlotte, 7 minutes on each side and then an additional amount of time, up to 10 minutes, is an appropriate amount of time, and is variable because chicken pieces will vary in size and thickness. can’t wait to try this, Nicole – thank you so much! happy 4th of july!!! Happy 4th to you, too, Shari! Oh boy oh boy oh boy. Can you tell I am giddy because of this! My daughter may even consider joining Ray and me in being totally GF after eating this! Thoughts about 7 mins on each side and then finishing in the oven? Question: I am not yet into mixing and making flour blends. What brand of gum free GF flour would you buy if you were not mixing? Hi, Mare! I honestly don’t know about frying and then finishing in the oven. Likely, the chicken would turn out greasier. I don’t know of a flour blend that is the same as my basic blend, I’m afraid! Yum! Did you know I worked at KFC through High School and College? and yes, I even did some of the cooking…..
Nicole you made our day! It is so hot here, I decided to bake some red velvet beet brownies at 4:30 am to beat the heat! KFC Chicken and brownies…yum! Have a great day Nicole, thanks for the recipe! HUGS!